Americans and Europeans both have been dealing with disappointing recoveries for a while, but their attitudes, like their economies, now are moving in different directions. 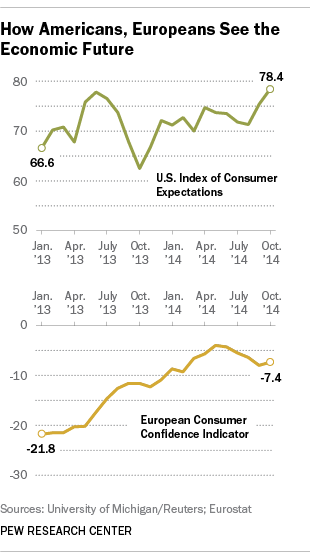 U.S. consumers’ expectations have risen over the past few months, after being more or less flat since late 2012. But European attitudes, which had grown steadily more optimistic since mid-2013, reversed this summer — perhaps a reflection of dimming prospects for the European economy. Europe’s economy has lagged the U.S. for the past few years. In 2013, for example, U.S. real gross domestic product grew 2.2% — not especially strong, but nearly Schwarzeneggerian compared with the 0.1% real GDP growth managed by the European Union. And while U.S. growth accelerated to a 4.6% annualized rate in the second quarter (the first read on third-quarter GDP is due out Oct. 30), EU growth remains anemic: Earlier this month, the International Monetary Fund projected that the advanced European economies would grow just 1.3% this year, versus 2.2% for the U.S.
We looked at two measures of consumer confidence: the University of Michigan’s Index of Consumer Expectations (part of its broader monthly surveys of consumer sentiment) and the European Consumer Confidence Indicator, produced by Eurostat, the EU’s statistical research office. While the two metrics are broadly similar, they’re calculated differently and reported on different scales. The UMich index is derived from three questions on personal financial expectations a year from now and expectations for the U.S. economy one and five years out, relative to a 1966 base year. The EU metric is the average of the answers to four questions covering expectations for household finances, general economic conditions, unemployment and personal savings over the next 12 months. In contrast, the European indicator hit its post-recession high this past May and then fell for four straight months, before a slight increase in October. That overall European figure, though, masks considerable variation among the 28 member states. Last month, Swedes, Danes and the Irish stood out as the most economically optimistic people in the EU, while Greeks and Bulgarians were the most pessimistic. And while you might expect a country’s economic prospects to influence consumer sentiment, that doesn’t appear to be the case: We found little to no relationship between a country’s consumer confidence level and the IMF projection for its growth next year.